Almost the hunter always hunt wild animal by the gun, firearm, and the others with the bullet. Have you ever challenged yourself to shoot with a bow? The least times try hunting with a bow and its arrow. If you are keen on hunting by this way, feral hogs are perfect target animal for you. Also, you have to look for much potential information which will support you to have a good game. For example, understanding shoot placement, when or where feral hogs always exist to find the food or drink resource, is very significant to have a good hunting wild pigs. In this post, we will find out where to shoot a hog with a bow. We can base on the picture to definite exact some vital organ in innards of the feral hog. Therefore, it is clear that the convenient of shooting a pig is behind the front leg which is mid-point of the chest and aim there. In fact, a hunter shared that it is slightly quartering away, with the foreleg forward, shoot in the armpit. The heart is 3 inches from the skin to the armpit and, he got the result as he can. 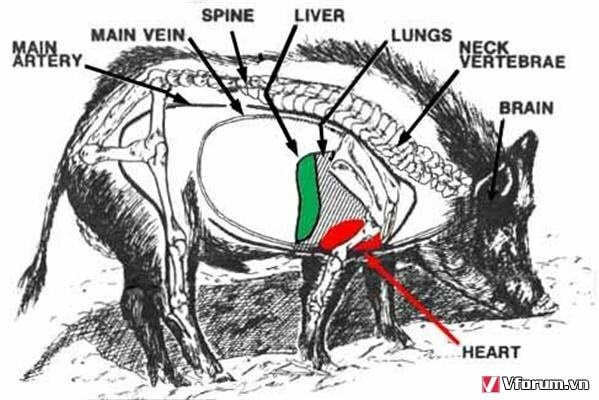 For shooting above you can make an arrow penetrate both lungs of the hog. And, it is the main reason for the quick death of hog. So, having an accurate aim is not a simple thing because sometimes the pigs turn away, turn back to feed, of course, they never stand like a wall for shooting because of living animal. Thus, if you are a patience person, maybe you have a chance to get a win. 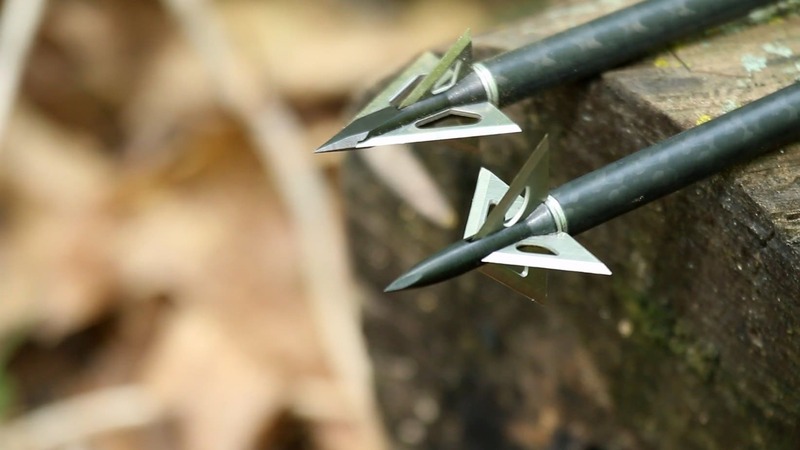 A broadhead will be useful with 2 or 3 blades for your game. If you were interested in shooting a bigger pig less than 125 pounds, you should use a broadhead three blade. It will be the better hole and, it also causes massive damage vital for each of hog. 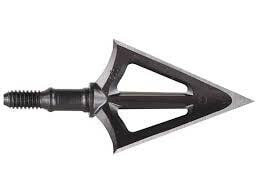 Besides, a broadhead with two blades also is a good choice. By the way, it can penetrate better than three blades. Some hogs which are smaller more suitable with two blades. A cording to a hunter he said that he got a hog about 65 pounds with two blades of the broadhead. Almost the people who got an experience in hunting, they considered that an actual instance to get a hog is 20 yards or less. It is close enough to define your aim and play your game effectively the most. Seldom, do an archery can have a chance to challenge them with further distance. Your camouflage is useful to avoid a dangerous vision of the hog. You need to use some branches to camouflage as a tree. Also, you should remember having a precaution for yourself by something like deodorant because the nose of the hog is the most sensitive organ. Therefore, if you do not want to encounter on the dangerous hog, you should take the deodorant which the hog do not realize yours exist. The feral hog’s eyes are not clearer than its nose so; slow movement is a necessary way to approach and choose standing place for shooting. And saying is smallest as you can. Usually, time action of hogs like the deer so, it will get easier when you hunt hogs in the early morning or lately evening when it is time pigs looking for a living. It is better when you keep going in the morning since it is more obvious to loot at each of action of the hog. Firstly, you can base on the trace on the ground to define footprint if was a hog or not. The second, according to the habit of a hog like in the dense forest with the big tree where can sleep underneath the tree. Also, the bank of the river, bottomland, hardwood and some areas are places which the feral hog can seek food and drink resource for their requirement in the circle. Besides, using the corn to trap the hog is an accurate method because corn is a favorite food for the pig. Furthermore, shallow area, wallow is absolutely for the hog to remove the bugs away. They are interested in rolling around in the wet place like those. Thus, this is a sign that you can seek the hog. Shooting a pig is not an easy work; nevertheless, finding the carcass of the boar is more complex as you can. Sometimes, the hog is not death immediately. In case, this is a big boar or sow or, your aim is not accurate. So, the hog will try to run fastest as it can to go away. As soon as do you catch up with the hog to have a sign from its print and the blood. It is worse to seek the trace on the ground if the hog runs in the dense. In contrast, if the hog doesn’t breath anymore or, the other word the hog death on the field immediately, you need to preserve meat of feral hog. A large of sea salt makes up over the meat. After you make following above steps and add some flavors which you like the meat, next fridge is the cooler place to soak meat within two days. Then you can drain meat and add more ingredient if you want. We hope that you will have an exciting game in the day off with your close relationship or someone. Indeed, we always all of you reach your aim as soon as you can after reading this article. Thus, keep going on and give us your comments which are your experience. Thank you for reading my post to know how to shoot a hog with a bow.